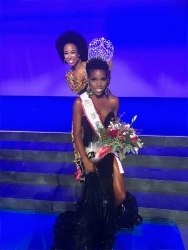 50th Anniversary Miss Black America is crowned. The new titleholder is 28-year-old Ryann Richardson, a consumer technology exec who represented New York in the historic competition at Kansas City's Gem Theater. Kansas City, MO, August 21, 2018 — Ryann Richardson is the 50th Anniversary Miss Black America. She joined the ranks of successful movie and television icons, and past Miss Black America participants, such as Oprah Winfrey, Toni Braxton and Bernadette Stanis during the jaw-dropping competition at the GEM Theater last Saturday, August 18, 2018 in Kansas City, MO. She was crowned by Miss Black America 2017, Brittany Lewis. Ryann Richardson is a 28-year-old native of the Washington, DC area who now resides in Brooklyn, New York. She is a consumer technology marketer, entrepreneur, and advocate for diversity and inclusion in business and technology. Recognized by Savoy Magazine as one of 2018’s “Most Influential Blacks in Corporate America,” Miss Richardson is Vice President at Victor, a multi-million dollar travel technology company and the leading global private jet charter marketplace platform. She formerly led East Coast regional marketing and strategic partnerships at Uber, where she also served on its employee-led Diversity and Inclusion taskforce. Ryann holds an undergraduate degree in business and marketing from Jefferson University (formerly Philadelphia University) in Philadelphia, PA.
As an advocate, Miss Richardson's personal mission is to create pathways for more women and people of color to attain educational and professional success, economic mobility and wealth generation through technology. She frequently speaks on panels and in conferences discussing issues of education, development, and opportunity for underrepresented populations and will spend her year of service as Miss Black America championing D&I initiatives. Ryann is a veteran pageant participant, having funded much of her undergraduate education with scholarships earned through pageants. She was Miss Philadelphia in 2009, and later served as the Miss District of Columbia USA 2017, dedicating her term to supporting efforts to advance the professional, political, and economic condition of women and minorities in the District and beyond. Judges for the historic competition included: Model/Actress – Claudia Jordan, Record Producer – Mike Zombie, Revolt TV Executive – Ebony Haley, Sr A&R Executive at Universal Music Group – Andre Williams, Miss Black America 1991 – Sharmell Sullivan, and 8 year child prodigy Amoy Antunet.